Elizabeth Ride: A selection of information reported in the BAAG Intelligence Summaries. During the Battle of Hongkong, December 1941. * At the outbreak of war, HMS Moth was in drydock with some plates off. The guns were removed and the ship was scuttled by flooding the dock. The dock gate was not destroyed. Later during the war an attempt was made – a torpedo was fired by an MTB but failed as the torpedo net was in position. Generating equipment in the powerhouse was destroyed. * 21st December: Heavy mortar fire directed at the Yard. By noon every gun emplacement in the Yard had been knocked out. * 24th December: Heavy artillery fire directed at the Yard. Some buildings were shelled but damage was superficial. The 100-ton crane destroyed. BAAG report early 1945 – Since the occupation of Hongkong the Royal Naval Dockyard has been under the control of the Japanese Navy, and is now known as the No 2 Naval Working Department. The dockyard commander is Rear-Admiral Tahara Kunizo. 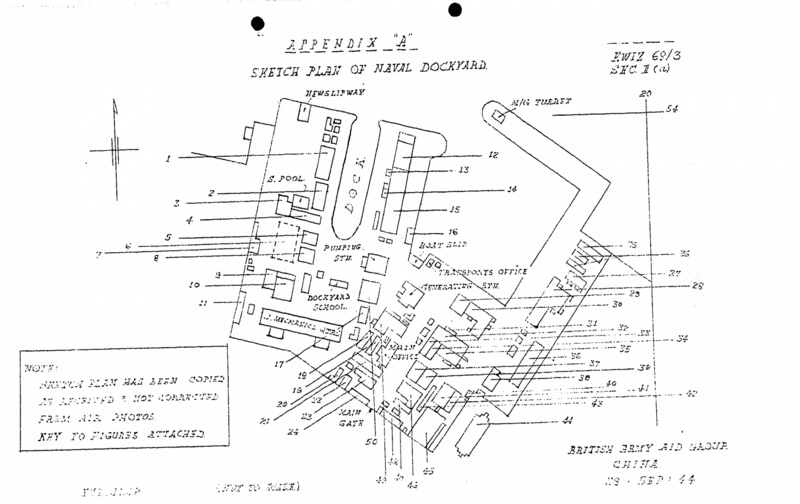 The only significant addition to the dockyard facilities reported made by the Japanese is the construction of a new slipway (possibly drydock) on the site of the former Football Ground, between the old drydock and Murray Road, completed in early December 1944. Ground sources have given varied dimensions for this slipway, but the figures of length 360ft and width 50ft appear to be confirmed by photo cover. Other facilities added by the Japanese are a boathouse on the site of the 100-ton crane wrecked during the hostilities in December 1941, and an underground air raid shelter, for the use of high-ranking naval officers, to the East of the New Fleet Accommodation Building. Power is supplied from 2 generating plants, with 3 diesel engines of 300 hp, 600 hp and 750 hp respectively, within the dockyard itself. An additional source of supply was the Hongkong Electric Co station at North Point, but this was suspended in August 1944. The 2 internal plants now supply both the dockyard and Wellington Barracks, the latter being occupied by the Naval Kaibitai and the Hongkong Harbour Office. There was a reduction in the number of dockyard workers in the latter part of 1944, a total of only 3267 personnel being reported in October, as compared with 5666 in July. Hours of work are from 0800 to 1230 hrs, 1320 to 1520 hrs and 1530 to 1730 hrs. Chinese employees are not permitted to resign, but a number of skilled workers nevertheless succeeded in leaving during 1944. 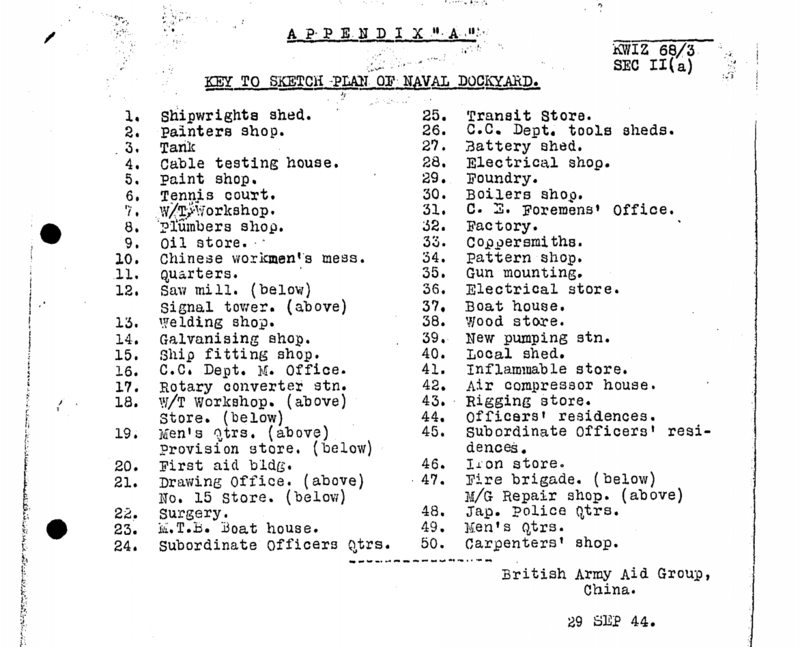 There is reported to be a shortage of tools, kerosene and all metals, particularly brass, bronze and copper, while the air raid of 16 January 1945 was said to have caused heavy damage to the yard. * May 1942: The organisation of the Dockyard seems to be the following: Japanese Naval Officer as Commodore; about 20 Naval Officers (engineers, technical and administrative staff); about 100 Naval Ratings; about 2000 uniformed technicians. * Mid-1942: about 1000 Chinese workers, employed almost entirely on repairing the sabotage carried out by the British Navy. End 1942, Chinese workers reported as ca 3000. * To sabotage the Dockyard, BAAG organised the defection to Free China of over 200 key skilled workers with their families [BAAG Operation Mateys]; the men were sent to India for war work, but the families remained the responsibility of the BAAG, who even started and maintained throughout the war a small school with Hongkong-style education for the children whose families intended to return to HK after the war. * Early 1943: number of Japanese workers reported as ca 500. New recruitment of Chinese workers, now numbering ca 3000, working hours ‘day and night’, mostly on salvaged ships, and breaking-up scrap for shipment. * 1944 – nearly 6000 workers in July, reduced to ca 3000 in late 1944. Chinese workers were not permitted to resign, but a number of skilled workers still succeeded in leaving during 1944. Late 1944: Japanese personnel total ca 800; Chinese workers were mostly unskilled, work was slow and morale poor. Skilled workers: all Chinese, before being classified as skilled workers, underwent 6 months’ apprenticeship. In the first three months an attempt was made to instil discipline and pro-Japanese sympathies by drill and propaganda. Any worker found slacking was punished by being made to stand for an hour with a full basin of water in his hands. Those who were absent without leave were beaten when apprehended. Dockyard gates were opened at 0700 hrs daily. Hours of work: 8-12.30 hrs, 13.20 -15.20 hrs, 15.30-17.30 hrs. Prevailing rates of pay: No 1 Electricians/Armourers etc MY7.10 per day; No 2 Electricians/Armourers etc MY6.10 per day; senior Draughtsmen MY6.10 per day; Fitters/Coolies etc paid MY6 – 4.50 per day according to age. For the price of MY1.00 per day the workers received one bowl of rice before commencing work at 0800 hrs. Workers of the equivalent grade of No 1 Electrician/Armourer received a ration of 20 catties of rice per month, when available; workers of the equivalent grade of No 2 Electricians/Armourers 15 catties of rice; workers of lower grades 10 catties of rice: This rice was sold at the nominal price of MY1.80 per catty. A free issue of 8 catties of sawdust per month for fuel was made to every worker. End 1944: workers pay was increased as from 1st December by 250%, but their rice ration was stopped. The generating plant was now so overtaxed that there were frequent breakdowns in the electricity supply. In order to conserve current, the dockyard authorities were using small improvised wooden cranes. The 50, 30 and 20 ton cranes were only infrequently used; when they were working, the power supply to some departments was cut off. There was a shortage of tools, brass and kerosene. * Three oil lighters, begun by the British, completed. Harbour Police patrol vessels. * 1944: 2 minesweepers, 2 wooden patrol boats, a number of MTBs, named King 1-12, reported to be built according to British MTB plans; work in progress on one speedboat. Repairs to Japanese ships and Salvage. * Extensive repairs to Japanese Cruisers and Destroyers in 1942, mostly done by Japanese workers. Repair of British sabotage, mostly done by Chinese workers. 3 Naval launches have been raised and put into use. Star Ferry sunk at entrance to the basin has not yet been raised despite several attempts. Jan 42 – Feb 43: damaged Japanese ships – 6; ships salvaged – 35; ordinary repairs – 183. Among ships salvaged: HMS Moth, 3 Naval launches, Kanwa Maru, Boom Defence vessel Barlight, Oil Tanker (salvaged in Aberdeen), HMS Thracian. Ships salvaged: Tai Lee, Kwangtung, Ashun Kwa, Hakuzi. Ships repaired: Junwa Maru, armed vessel (unnamed), Tokusei Maru, Koko Maru, Destroyer, Nam Hoi/Nankai Maru, Wo Chuk Maru, Destroyer Wan San, Nanjun, Surote Sumo, Ning .. Maru, Fook Li/Fukuri Maru, Fook Hoi/Fukukai Maru, Nam Li/Nanri Maru, Destroyer Tsui Fung/Oikaze Maru, Hoi Tak/Kaitoku Maru, Destroyer Karisomone, 6 Special Guard boats, Destroyer Tobitaki Hiru, Gunboat, Destroyer, On Lee Maru, Tikusan, Wo Sing, Destroyer 156, Hoi Ping, Yuan Ti (formerly salvaged), Shuk Sing Maru, Hoi Fung Maru. Ships repaired: Minesweeper No 102, Yo Fei/Anri, Chohatsu, Aldgate, Watergate, Umeshima Maru, Tsuruarashi/Kakuran Maru, Patrol Cutter No 4 Muun, Patrol Cutters Shinshu, and Junei, Destroyer Kyoko/Hashimitsu (later sunk), Minesweeper No 102, Kaito/Takashima Maru, Tokyo Maru, Chosu/Josu Maru, Submarine Tsurugi, River Gunboat Maishi, Minesweeper No 101, Kyowato/Kyowashima Maru, Patrol Cutters Shinsu and Junei, Torpedo boat Hatsukari, Arashiyama/Ramsan Maru, Gunboat Maishi/Maiko, Tai Lee, HMS Moth/Suma, Saga, Anri Maru. This article was first posted on 30th January 2015.